Few individuals have been able to reshape and redefine the urban landscape (or work a mean mustache) like the late, great John Chase. The legacy of this legendary writer and urban designer continues to live on in Los Angeles, his vibrant spirit dwelling in the colorful, lively public spaces he helped to develop. Last year, de LaB partnered with KCRW’s Frances Anderton to celebrate John’s influence in West Hollywood. From Plummer Park to West Hollywood City Hall, friends and admirers took a city-wide tour on the talented designer’s May 21st birthday, remembering his efforts to create beautiful, functional, and successful urban spaces. To celebrate John’s profound influence on West Hollywood and the design community at large, the LA Urban Forum and design east of la brea produced this one-of-a-kind walking map, including 31 WeHo destinations that John designed, protected, enabled, approved, admired or frequented, along with descriptions, stories and anecdotes written by John’s friends and collaborators. Designer Keith Scharwath created the map in an eye-popping trademark John hot pink hue. The commemorative map is now available for purchase online. One map is $5, and three maps are $10. Prices include shipping. If you’d like to buy four or more maps, please contact hello [at] designeastoflabrea [dot] org. Own your own special little piece of an LA design legacy. Click HERE to get more information about purchasing a John Chase West Hollywood map. Been: The Square @ ULI Live! Last week we joined 6,000 attendees from all over the country at the annual ULI Fall Meeting which returned to LA this year. To give the visiting urban land folks a taste of LA, we worked with KCRW’s Frances Anderton and ULI LA‘s Sandra Kulli and Clare De Briere to curate a selection of pop-up shops set up around a mini-zocalo, each offering a native take on place making. 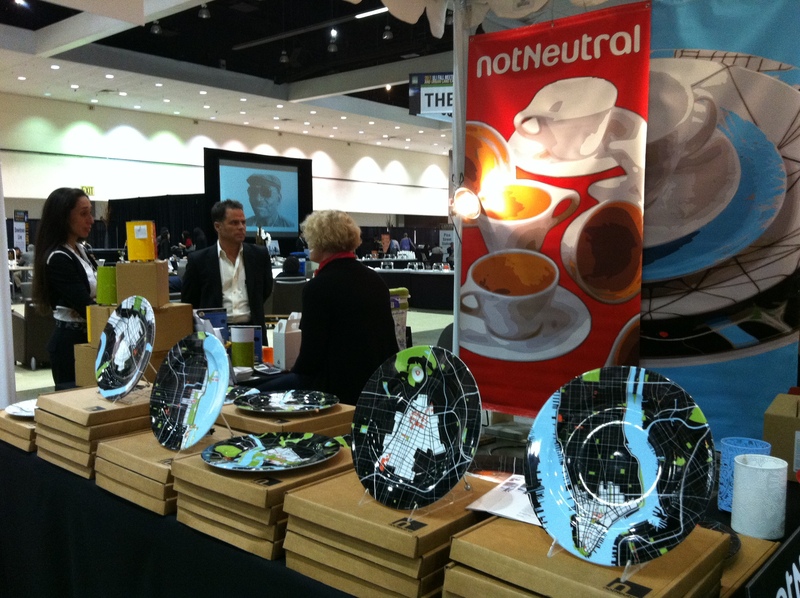 The Square proved to be a draw throughout the conference, with Homeboy Industries‘ graphic tees flying off the shelves, Conscious Commuter‘s electric fold-up bicycle attracting waves of other conscious commuters, and wanderlusters lusting over notNeutral‘s map-inspired dishware. Live performances by singer/songwriter (and chemist!) Dafni, the Youth Orchestra of Los Angeles, USC’s “Spirit of Troy” Marching Band, and the Finn Kappe Sextet brought even more local flavor to The Square (which ironically could be found under a very triangular sign!) Judging by the fact that the seats were packed throughout the conference, we think they liked it. More importantly, for us it was a great opportunity to hang out for a few days with some of LA’s best and brightest. The only downside: arctic LA Convention Center temperatures and not seeing daylight for three days. Special thanks to Haworth and Unisource for providing the furniture for the entire Square. Without their contribution, the wheelers and dealers would have had nowhere to do their wheelin’ and dealin’. Also, a huge thank you to all the amazing LA participants: Art Center’s Advanced Mobility Research group, Bloom Energy, Community Arts Resources, Otis College of Art and Design, SCI-arc, USC, Woodbury University, HOLA, Skylight Books, Watts House Project, Bill Kleiman, Behn Samareh, Standard, Tiffany Tedesco, Oyler Wu Collaborative, Rethink LA, John Friedman Alice Kimm Architects, and Tom Schnabel. Also big ups to the Finn Kappe Sextet for performing for a small-but-quality crowd and DJ Raul Campos for hanging out with us. This project just further proves to us that LA is filled with some pretty awesome, talented, and ingenious people. Go: A Night at The Square @ ULI Live! If you’re already planning on attending the ULI Live! 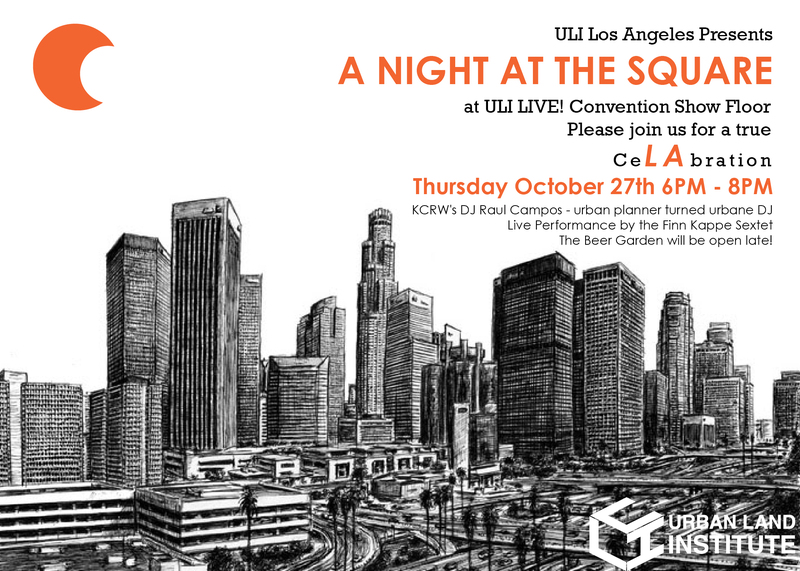 Conference, the Urban Land Institutes Annual Fall Meeting which is being hosted here in LA this week, don’t miss ULI Los Angeles’ love letter to LA, a Night at the Square on Thursday night. Co-curated by Frances Anderton, Clare De Briere, and Sandra Kulli, with some Secret Agent input, this pop-up zocalo promises to bring LA to life. 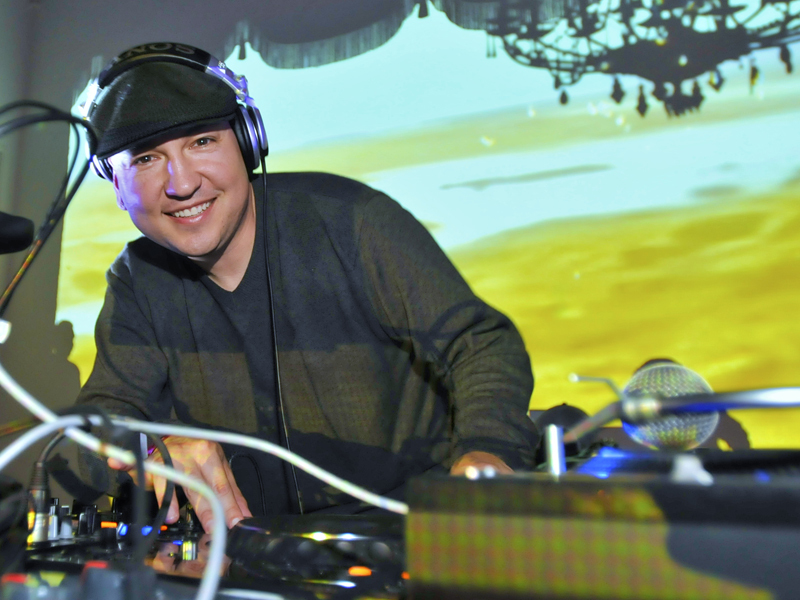 Don’t miss live performances by KCRW’s DJ Raul Campos, the urban planner-turned-urbane DJ, and the Finn Kappe Sextet. See you at the Square! Normally, we try not to post about our clients (separation of church and state, etc.) but we’re happy to make an exception this time. The Urban Land Institute is hosting its annual conference here in LA next week and we’re thrilled to be working with them to produce The Square @ ULI Live!, a unique space that brings LA to life for conference attendees who might not otherwise see or be able to navigate this complicated megacity. Curated in collaboration with Frances Anderton of KCRW’s Design and Architecture and ULI LA‘s Sandra Kulli and Clare De Briere, The Square is a vibrant patchwork of organizations and individuals who are making their mark in the realm of place-making with their own distinct LA-style. The Square will feature pop-up “shops” selling a curated mix of ideas, visions for the future, and products. Art Center‘s Advanced Mobility Research group and Conscious Commuter will showcase a range of conceptual solutions for urban mobility. The Advanced Mobility Research group will feature their own futuristic take on the car, while Conscious Commuter (a company co-founded by an Art Center grad) will feature their electric fold-up bike that is meant to integrate holistically into existing mass transit. Recently named as one of 15 game-changing start-ups that will change the world by CNN Money, this maverick energy company will be lighting up the Square with their future-forward thinking. Fresh off the success of the third CicLAvia in LA, Community Arts Resources will be on hand to show attendees their approach to cultural planning and shaping public space. Four local educational institutions will be showing representative student work that embodies their signature take on place making. Participating schools include Otis College of Art and Design, SCI-arc, USC, and Woodbury University. This local non-profit will show attendees exactly how they engage youth in the arts, particularly their joint program with the Youth Orchestra of Los Angeles (YOLA). Also known as YOLA @ HOLA. 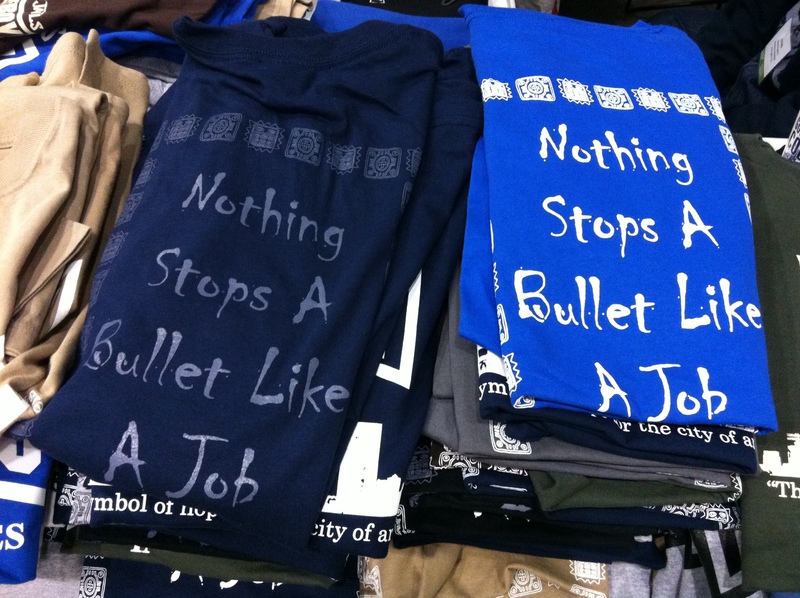 Catchy, right? This LA establishment will be selling their designer wares, among them their new collaboration with Artecnica. notNeutral will set up shop at The Square, offering up their signature brand of colorful, modern, perforated accessories for the modern home and garden. Longtime LA fixture and quintessential neighborhood bookstore Skylight Books will set up their mobile store for the attendees’ perusing leisure. Edgar Arceneaux’s artist-driven neighborhood redevelopment project will show attendees what their colorful vision is for the future of this South LA neighborhood. With an insider’s understanding of the LA art scene, including the epic region-wide Pacific Standard Time initiative, LA Art Gallery Tours founder Bill Kleiman will be on hand to help attendees navigate the city and its many galleries. The 20,000 sf space will also be peppered with public art installations designed by LA artists, architects, and designers. Some of these installations will look very familiar while others are being created especially for the occasion. 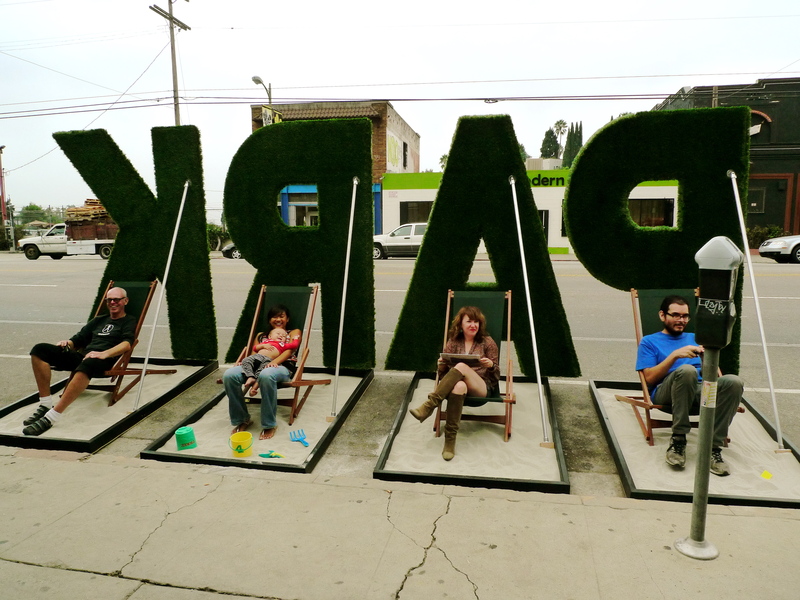 Silver Lake architecture firm Standard debuted the LOCAL Park installation in September as part of the Park(ing) Day LA festivities. At once literal and symbolic, the installation was a collaboration with de LaB. This interactive Park(ing) Day installation curated by Tiffany Tedesco brings together local community activists and artists to show how people can reclaim their public space and create their own parks. 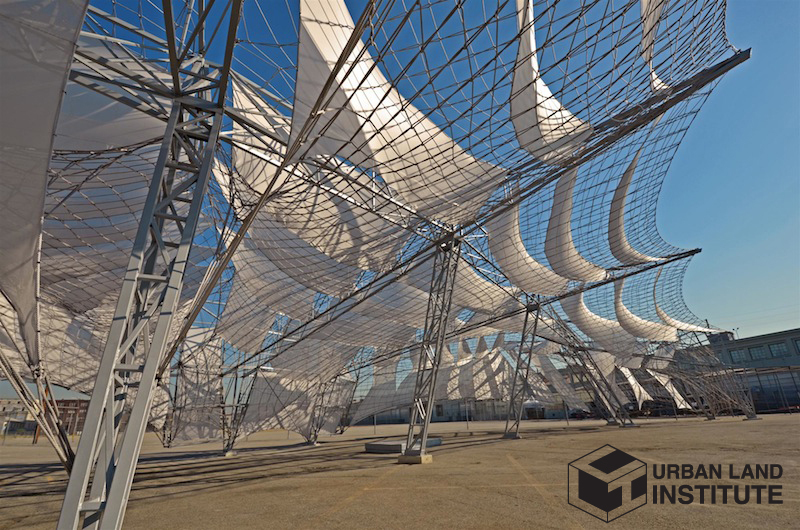 Oyler Wu Collaborative will be showing the model of the Netscape graduation pavilion that they designed. The real thing can currently be seen outside SCI-Arc. The future-forward exhibit by Rethink LA exploring what our city might look like in 50 years that debuted at the A+D Museum will be making a re-appearance in The Square. The much-lauded Re-imagining Wilshire interactive modeling table designed by James Rojas that contextualizes the city as play is of course part of the modular exhibit. Los Angeles is the undeniable film capital of the world. But beyond the Hollywood stars, the city itself is a leading character. These curated shorts shine a spotlight on the City of Angels and the leading cast of creative stars that make up the rich fabric of this shining city. From the streets to the global arena this is a snapshot of the place we all call home; LA. The Square will feature a revolving loop of film segments including: films commissioned by John Friedman Alice Kimm Architects for the Guadalajara Book Fair Pavilion, Heidi Duckler Dance Theater, and Out the Window. During session breaks, attendees will enjoy downtime in the Square punctuated by live performances by local musicians, including the Spirit of Troy USC Marching Band, local chemist and chanteuse DAFNI, and the Youth Orchestra of Los Angeles. On Thursday, October 27th, the Square will stay open late for a Night at the Square. KCRW’s Raul Campos will spin a set followed by a performance by the Finn Kappe Sextet. Throughout the conference, we’ll be playing an impressive play list compiled by KCRW’s Tom Schnabel. Besides a beer garden designed by The Lab, the OC’s anti-mall, and cafes serving Intelligentsia‘s eye-opening brews, The Square will also feature Haworth‘s interpretation of the NewWOW, or ways of working. It’s the office, as re-imagined from the year 2020. Interest piqued? Unfortunately, the conference is not open to the general public. But if you’d like more information about how to register for ULI Live!, click here. If you were driving down Sunset Boulevard yesterday, it was hard to miss LOCAL PARK. 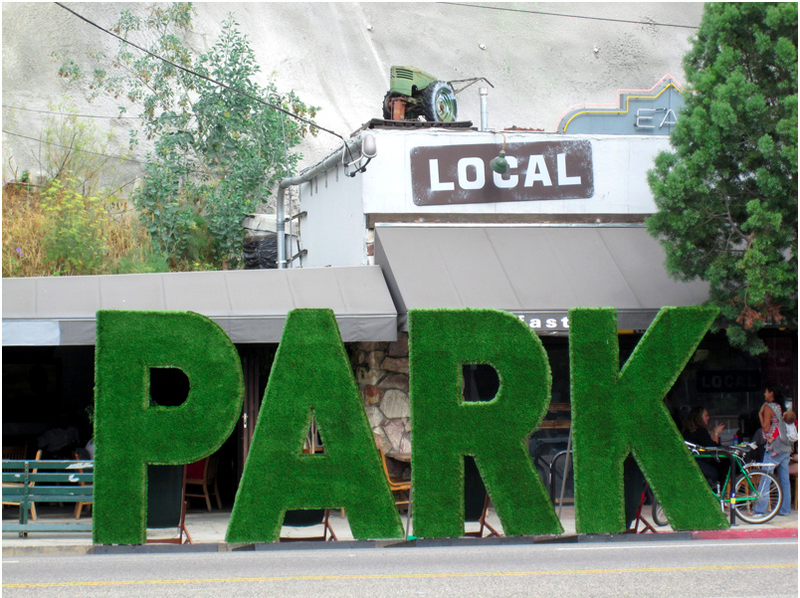 As part of the Park(ing) Day LA festivities, Standard collaborated with de LaB this year to create an unforgettable pop-up park in front of Jason Michaud‘s LOCAL restaurant. The installation was part directive (park your car…), part invitation (…and stay for a while! ), and when viewed from across the street, almost seemed like a new form of urban graffiti in the best sense of the word. We camped out all day to watch how people reacted to and interacted with the parklet. 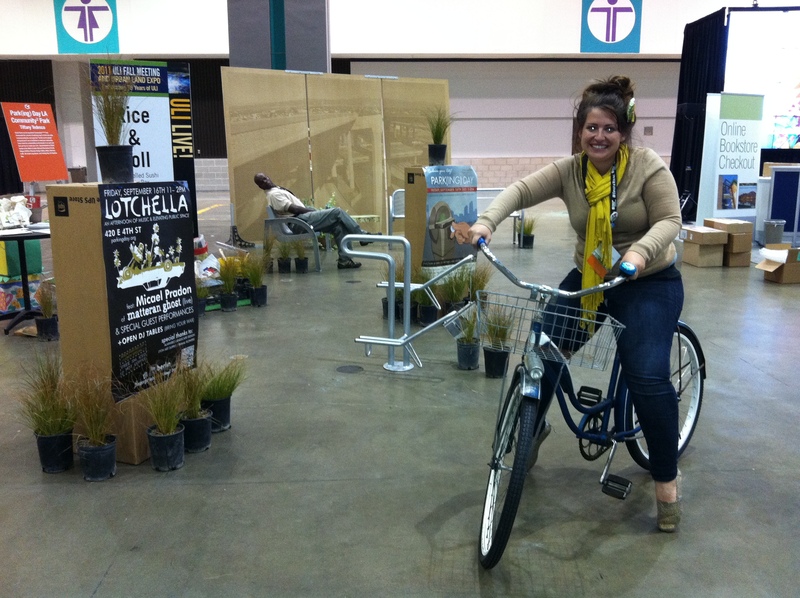 Missed the pop-up parks on Friday? The public gets another chance to see some of them at ArtCycle today. Many of the parks will be setting up side by side along Santa Monica Boulevard in what organizers have dubbed “Parallel Parking.” Kill Radio will also be showing footage of the parks at the end of the month at an event at the Bike Oven. Huge hats off to all the Park-ticipants and Park-itects who helped reclaim LA’s streets for the people. LOCAL’s Jason Michaud taking a much-deserved break in the park. The little ones approve. All the world should be a sandbox. First full park of the day.